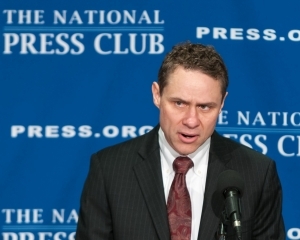 Wes Bush, chairman, chief executive officer and president of Northrop Grumman Corporation, speaks at a National Press Club Newsmaker, December 3, 2012. President Barack Obama and congressional leaders must reach an agreement to avoid the ``fiscal cliff'' and potentially devastating cuts in defense spending, industry executives said at a Dec. 3 National Press Club Newsmaker. More than 130 CEOS signed a letter to Obama and Congress members that was released at the event. The document urges them ``to avert sequestration and adopt an approach that addresses the country’s long-term fiscal challenges,” said David Hess, president of Pratt & Whitney and chairman of the Aerospace Industries Association. Solving the fiscal cliff will “do more to unleash investment, a willingness to hire, [and] a willingness to take chances that will then create a huge new wave of job creation and economic growth in the United States,” said David Langstaff, CEO of TASC. Delaying a decision until 2013 is not an option, the executives said. “Piecemeal efforts or punting or kicking the can down the hall where we buy a little bit of time [will] add to the confusion,” Langstaff said. A framework agreement by the end of the year that would avoid sequestration will likely include some defense cuts in addition to the $487 billion already being implemented, Langstaff said. “We need to stop believing or pretending that there is a scenario out there that offers no defense cuts,” he said. No one on the panel was willing to say how much in defense cuts would be acceptable to the industry. The uncertainty is causing companies in the supply chain to delay critical decisions, which could delay necessary parts in the future, said Dawne S. Hickton, president of RTI International Metals. “What we are manufacturing in our plants today is going on a military program two and three years down the road,” Hickton said.